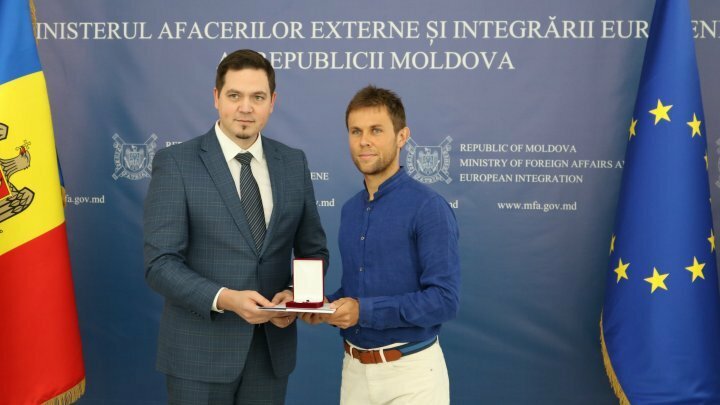 Radu Albot tennis man was awarded by Diplomatic Medal of our country for his activity. He was decorated by Tudor Ulianovschi, the Minister of Foreign Affairs and European Integration. Minister Tudor Ulianovschi highlighted that through his success within the ATP tours, Radu Albot promoted the image of our country abroad. He teaches our community only good things. "The good results that he always brings made us give him this award", mentioned Tudor Ulianovschi. At his turn, Radu Albot mentioned that he is honored to receive this title. He thanked Minister Ulianovschi for the opportunity that he got to met the MAEIE team. "I will always do my best to make our country famous all around the world", said Radu Albot.